Adapted from an original recipe from Marie Claire cookbook Taste 101. Recipe adapting, styling and photography by Tanya Zouev. Easter is a time most of us in the Western world have come to associate with chocolate. I’m all for chocolate at any time of the year, and not necessarily in the shape of an egg. For example I’m very happy to eat chocolate in the form of this cake. This recipe evolved from one I found in a cookbook by Marie Claire (Taste 101) which came out in print about 2005. I had been searching for a gluten-free chocolate cake recipe and their “Almost Flourless Chocolate Cake” seemed like a good place to start. I completely reworked the recipe into a truffle-style boozy mud cake and of course, made it gluten-free. The original recipe contained a tablespoon of cognac. I love cognac but felt it wasn’t the right flavour pairing for the chocolate in this particular cake so I substituted it with vodka. Speaking of hard spirits, I do have a particular fondness for desserts containing them. I actually have a fondness for alcohol in general but I drink very little of it (I’m a lightweight who can’t hold their liquor). When I do consume alcohol I want it to be good, and even more importantly, I want to taste the booze if a recipe speaks of it. I’m not a happy lady if a champagne truffle makes me a promise, then breaks it by tasting just of chocolate. The cake is best made the day before as I find it improves after being overnight in the fridge to set properly. When cutting into the cake use a knife dipped in hot water as this will help it to glide through easily (wipe the knife between slices). Make sure you follow the method described below and you will be sure to enjoy a very grown-up mud cake this weekend at Easter lunch. I for one will be leaving the crème eggs for the kids. Prep time 30 minutes, cooking time 50-60 minutes. * for a sweeter cake use 50-60% cocoa dark chocolate, for a bittersweet cake use 70-80% cocoa dark chocolate. The latter will produce a slightly crumblier cake. ** for a subtle vodka taste 1/2 of a cup is enough, however if you want quite a strong vodka experience then add 2/3 of a cup. Any more than this and you will get drunk off the cake (which might be an appealing concept for some cooks). 1. Preheat your oven to 150˚C (300˚F) and line a 20cm (8”) springform cake tin with non-stick baking paper, line the sides as well. Give the paper a spray with some oil as well as this cake tends to stick. 2. Into a double boiler (or a metal bowl over boiling water) over medium heat melt the dark chocolate, cocoa and sugar. When it is partly melted add the boiling water and butter, stir well then add the egg yolks. Mix through until combined, take off heat, pour into a mixing bowl. 3. Add to the chocolate mixture about a tablespoon or two of vodka alternating with the almond meal and stirring between each addition. Don’t pour the vodka in all at once as the chocolate will split. Add the potato and tapioca starch and stir until combined. 4. In the bowl of a mixer beat your egg whites until they go fluffy then add the cream of tartar, vanilla and second half cup of sugar slowly in tablespoonfuls until soft glossy peaks form. 5. Add the raw meringue to the chocolate and gently fold in. 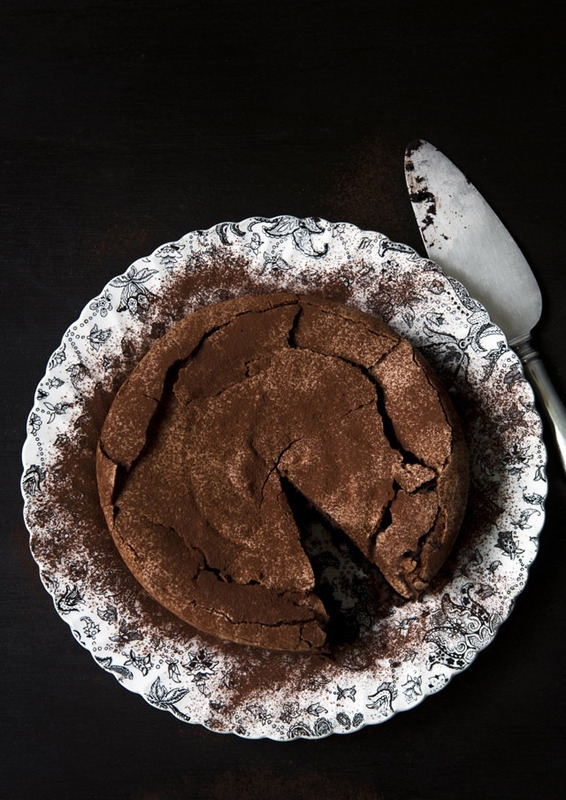 You don’t want to overwork the mixture, you want a just-combined batter which will give you a dark and moist chocolate truffle cake with a crisp and light meringue top. 6. Place in oven and bake for 50 minutes at 150˚C (300˚F). Insert a skewer which should come out quite moist, however if it comes out too wet leave the cake in the oven for a further 5-10 minutes. Over-cooking this cake will make it too crumbly so don’t leave it in for longer than one hour. The cake will puff up then as it cools the top will crackle and drop slightly. 7. Let the cake cool in the tin on a cooling rack. Refrigerate overnight (in the tin) to set and dust with extra cocoa before serving. Divine served with double cream and fresh raspberries. I like my chocolate dark and moody so I photographed the cake on an almost black background which is a piece of veneered timber found in hard rubbish which looks like it was once a kitchen cupboard door (I stained it walnut). The plate is a vintage Johnson Bros “Paisley” print I found at the local Salvo’s. The vintage cake lifter was from a lovely lady who sells the daintiest vintage kitchen finds at Manly Markets. The only lighting used here is window light. There is just something about a boozy chocolate cake…this is so sinful..I want right now!! Is there a non gluten free version of this recipe? No disrespect to anybody, it’s just that some of the ingredients are hard to find in my area and I’d really love to try this cake out. Just amazing. This completely stole the show. I used red grapefruit vodka and served it with fresh pink grape fruits and pistachio brittle. Such a sophisticated recipe. I’m drooling already! Your cake looks crispy on the outside also very moist and fudgy on the inside. Adding alcohol to dessert is the next thing I’d like to experiment. I am thinking of trying this for our bookclub meeting Friday since we are having a cocktail themed night. Can’t wait. It looks incredible!